AGT has an innovative immuno-oncology program and U.S. patents protecting its ImmunoTox viral vector platform that harnesses the power of gamma delta (γδ) T cells to revolutionize cancer therapy. The ImmunoTox vector re-programs tumor cells to become potent stimulators of γδ T cells. The activated γδ T cells are highly effective killers of tumor cells and may circulate through the blood to find and kill secondary tumors or metastases. The components of γδ T cells and how AGT’s ImmunoTox vector approach is unique in the development of cancer gene therapy. The thymus is an important source of T cells, especially during early development. A small gland located at the top of the sternum, the thymus is a nursery for T cells. It produces multiple different types of T cells that defend against infectious diseases or cancer. The thymus contains primitive precursor T cells (thymocytes) that mature into adult T-cells, ending up as one of several types. They may generate the familiar CD4 or CD8 T cells with well-known functions. These same thymocytes also have a chance of becoming γδ T cells and ending up in one of three main subsets of this category. The subsets are designated by the type of delta chain (part of the γδ T cell receptor) that is used and include Vδ1, Vδ2 and Vδ3 cells. There are more delta chains, but they are rare in the body and less well studied. AGT’s focus for cancer therapy is the Vδ2 T cell, shown in red, which is found in blood, lymph nodes and spleen. 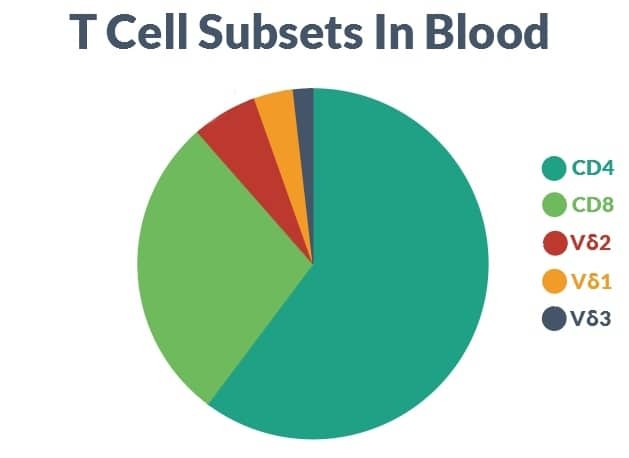 The Vδ2 T cells (here called γδ T cells) are a small fraction of total blood T cells but comprise the most abundant type of γδ T cell. 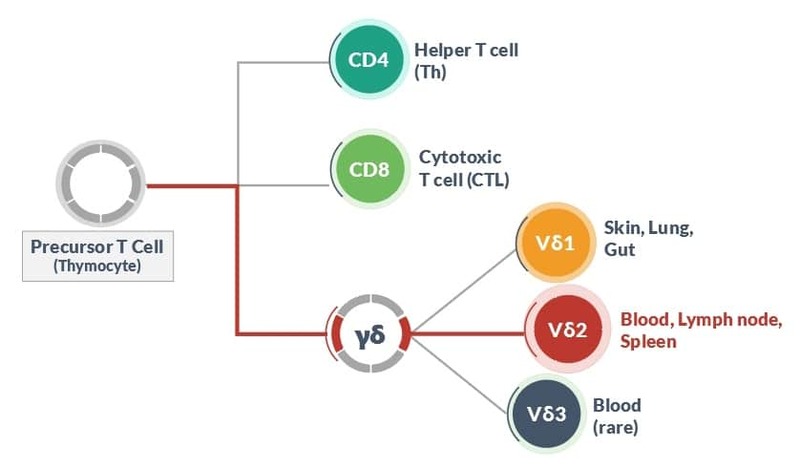 In healthy adults, γδ T cells (Vδ2 type) are around 6% of total T cells in blood and are about twice as common as the next most frequent Vδ1 T cell. Although they are dwarfed in abundance by common CD4 and CD8 T cells, the γδ T cells have many special properties that make them extremely attractive as instruments of cancer therapy. All T cells have a vast array of cell surface molecules that are used to identify them and enable key cellular functions. Indeed, CD4, CD8 and γδ, three names for T cell subsets, are also the names of specific cell surface molecules. 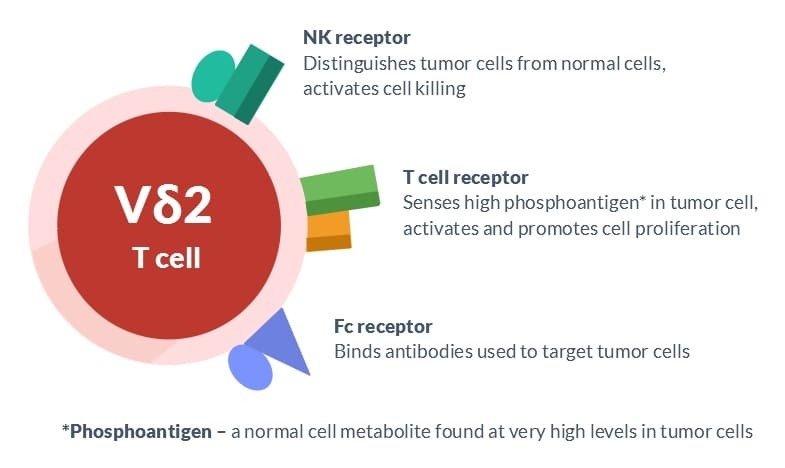 To understand more about AGT’s favorite γδ T cells, it is helpful to know the names of three critical cell surface molecules starting with γδ, also known as the T cell receptor, NK receptor and Fc receptor. Each has a specific function that is important for tumor cell killing. The T cell receptor is composed of two proteins called gamma and delta, thus giving these cells their main designation. The T cell receptor recognizes antigen, which is a stimulatory compound made at high levels in tumor cells. T cell receptor is the ignition key and gas pedal for γδ T cell responses. It causes γδ T cells to proliferate and perform their major functions, which include producing immune regulating compounds (cytokines) and acquiring the ability to kill tumor cells. The NK receptor is key to the exquisite ability of γδ T cells to distinguish tumor cells from normal cells. This receptor is actually a family of cell surface molecules that make γδ T cells more active killers when they contact tumors and turn off this function when they approach normal cells. The Fc receptor is a molecule that binds to antibodies including those that are used for cancer therapy. Binding many antibodies can also help to stimulate tumor cell killing by γδ T cells. HOW DO THEY WORK IN AGT’S STRATEGY FOR CANCER THERAPY? The antigen recognized by γδ T cells is known as Phosphoantigen. This is a small 5 carbon molecule that is a part of the biochemical pathway for making cholesterol. When tumors are growing rapidly, they need to make large amounts of cell components including the cell membrane; cholesterol supports membrane synthesis. The γδ T cells evolved a way to detect the levels of phosphoantigen and they interpret high levels as a danger signal. AGT developed a family of lentivirus vectors known as the ImmunoTox vector platform, which can increase phosphoantigen levels in tumor cells. For example, the lentivirus vector AGT401 integrates a gene into the tumor cell DNA that causes cells to accumulate phosphoantigen until it reaches stimulatory levels. These genetically modified tumor cells stimulate γδ T cells through the T cell receptor and increase γδ T cell proliferation and functionality. The ImmunoTox strategy was designed to overcome a key problem with gene therapy for cancer – a viral vector is unlikely to modify every cell in the tumor and you need a therapy that attacks the entire tumor. The beauty of AGT’s immuno-oncology strategy targeting γδ T cells is the solution to that problem. Once the γδ T cell has been activated by phosphoantigen stimulation through the T cell receptor, it now depends mainly on NK receptors to detect the correct targets for killing. 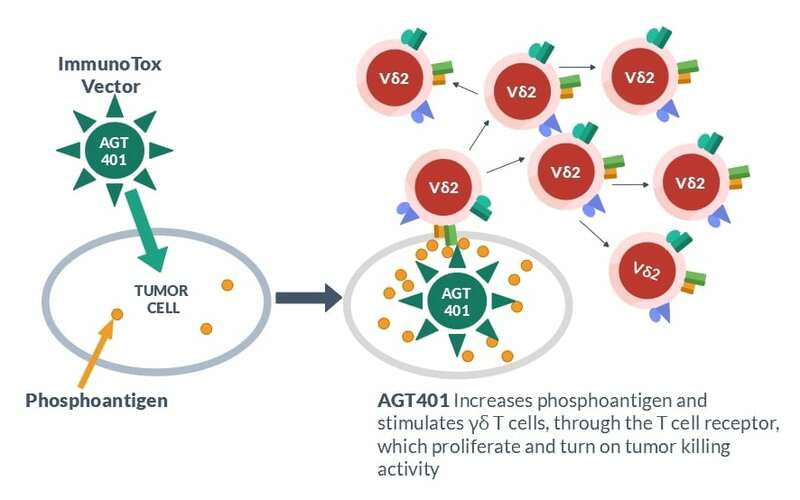 Because the T cell receptor is not required for tumor cell killing, the activated γδ T cells will kill tumor cells whether or not they contain viral vector AGT401. If they are revved up, the γδ T cells will use NK receptors to recognize and kill all cells in the tumor. Further, γδ T cell proliferation might produce enough of these cells to travel through blood, find secondary tumors or metastases, and kill them as well. The fighting strategy of γδ T cells, right jab for stimulation, left hook for knock-out, gives AGT a unique strategy for harnessing T cells to attack cancer. What’s more, the γδ T cell response to phosphoantigen is ubiquitous in the human population, so AGT believes it only needs one approach to stimulate γδ T cells in everyone which is expected to attack a broad range of tumor types. ImmunoTox vector makes a genetic modification in the tumor but does not change the T cells. Once the tumor is gone, the genetic modification is gone, and the patient is left with a normal immune system. All human beings possess the γδ T cell response to phosphoantigen, so this strategy for cell activation is universal. The γδ T cells target a broad range of solid and liquid cancers. Instead of multi-year efforts to develop targeted drugs for each type of cancer, AGT uses one method to attack many cancers. The breadth of γδ T cell responses argues that ImmunoTox may be useful for rare cancers or cancers where no specific therapies have been developed. AGT can boost the potency by adding γδ T cells grown in a laboratory. The peculiar nature of phosphoantigen recognition means the body’s own (autologous) or donor (allogeneic) cells can be used to create a therapeutic cell product. AGT’s program is advancing through small animal studies to define dose, route for delivery, timing of therapy and safety. AGT is anxious to advance this toward the clinic as an important new approach for curing one of the most feared human diseases.